Val'shaarah:Forgotten Druid Refuge - Malfurion becoming a druid, lots of Night Elf lore. we get glimpses into the Emerald Dream. Azauna: You will see this place was once something very special. Ghosts of ancient night elves, remnants of blue dragonflight, we'll be facing Queen Azshara here. High Mountain Tauren: Keepers of Kazgoroth's item. Lair of the Earthwarder, Neltharian - he's still dead but there are other things there. Nesingwary is in this zone. Suramar: New race of elves - Lived there for last 10k years, flourished from Magic abilities, become pawns of the burning legion, they have the last relic we need. Fighting ultimate enemy needs ultimate weapons. Retrieving items like shards of Frostmourne. You can earn Artifact power for your weapon through various activities. Empower weapon, empower character, change appearance of weapon. Unlocking abilities on your weapon like a talent tree. You are the leader who has this amazing artifact weapon. Placed in thematic areas - Light's Hope Chapel, Maelstrom, etc. Place to do Artifact stuff. Evolution of Draenor system - just numbers won't work here, they are infinite. You collect members of your class to fight the Legion. Halls of Valor: Level up dungeon above Stormheim, inspired by Valhalla. Vault of the Wardens: where we hunt down Illidan, lined with cells, etc. Last edited by shadybrothers; 7th November 2015 at 12:39 pm. Old news, lol. Not really but yea really. 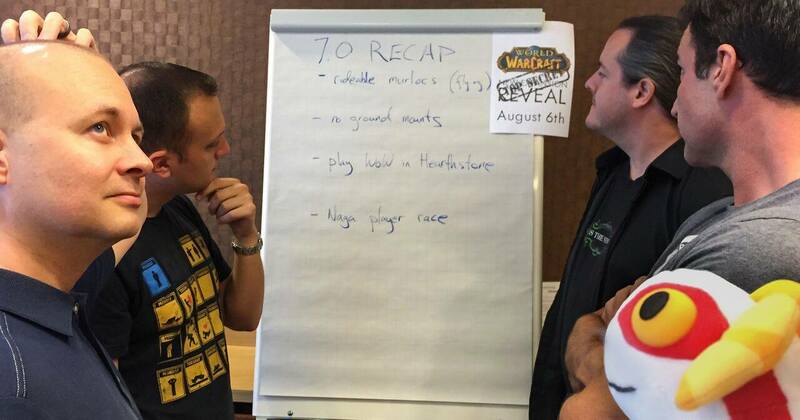 If you go back and look at the leaks from a few years back this was on the timeline schedule after WoD, I was fully expecting another legion xpac. So this xpac has 9 dungeons and 2 raids with Guldan being the final boss? Seems kinda light on content but at least there are some new features such as weapon talent trees sound cool. Are they making Guild garrisons? They seem quite far along compared to other expac announcements, good they actually also showed a lot of stuff with the announcement. Looks awesome to be honest, funny to see them steal ideas from XIV though xD (artifact weapons) but it's a good approach and hopefully the process takes long, gives us something awesome to do. Very happy with this announcement. let's hope they don't take anything out along the way. I wonder if the boost to 100 works on Demon Hunters? I kinda hope not.. but not too fussed, especially if the tutorial area is really well designed. Class Hall concept is interesting. Biggest party is probably in the druid hall. Night and Blood elves only. You start in the past, being sent out by Illidan. Sounds awesome. So what more will they have for us at Blizzcon? Gul'dan won't be the final boss. It HAS to be Sargeras. This is rumored to be the final WoW expansion? Why does that require an excuse? What was their reasoning? This is rumored to be the final WoW expansion? wut. no. If anything their plan is to pump out expansions more regularly. It requires an excuse because every other class has at least 3 specs and they've managed to make other classes work like that - their excuse was "Two DPS or Tank specs would water down the identity of the class." Not sure where you would have heard that rumour. They've come out and said they've got 2 or 3 more expansions, including Legion, planned at the minimum. They're probably already working on the one after Legion, and throwing around ideas for the one after that. edit: just read the OP further... UNRIVALED MOBILITY: Demon Hunters can double jump, vault in and out of combat, and even unfold their monstrous wings to perform gliding descents and surprise enemies from above. I'm probably going to reroll anyway (stop laughing skork) tried to Arena last night with a friend of mine who's really good at PvP and I struggled so badly with Hunter, completely different story in BG's... Arena is not friendly to Hunters, especially with everyone playing Warrior/DK/Pally.... seriously is Warrior the new rogue? so much CC and damage output. i wonder if they'll offer a 100 level jump .... i still have my free 90 jump unused. "free 100 boost with purchase"
The artifact bow looks badass though, guess that will be for marksman, BM gets a gun. Not sure giving everyone Ashbringer lookalikes is gonna work out. Might just look silly. Guessing we'll see some Demon Hunter gameplay at Blizzcon plus a release date. aye, i bet attendees will be able to play! They should add a fourth spec to Hunters called "Demon" just to confuse people.